Swing music, or simply Swing, is a form of American music that developed in the early 1930s and became a distinctive style by 1940. Swing uses a strong rhythm section of double bass and drums as the anchor for a lead section of brass instruments such as trumpets and trombones, woodwinds including saxophones and clarinets, and sometimes stringed instruments such as violin and guitar, medium to fast tempos, and a “lilting” swing time rhythm. The name swing came from the phrase ‘swing feel’ where the emphasis is on the off–beat or weaker pulse in the music (unlike classical music). 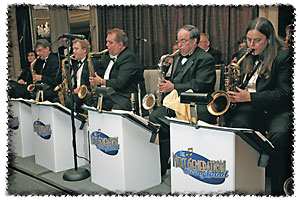 Swing bands usually featured soloists who would improvise on the melody over the arrangement. The danceable swing style of big bands and bandleaders such as Benny Goodman was the dominant form of American popular music from 1935 to 1946, a period known as the Swing Era. The verb “to swing” is also used as a term of praise for playing that has a strong rhythmic “groove” or drive. Swing has roots in the late 1920s use of larger ensembles using written arrangements. The period between 1935 and 1946 is when big band swing music reached its peak and was the most popular music in America. This period is known as the Swing Era. A typical song played in swing style would feature a strong, anchoring rhythm section in support of more loosely tied wind, brass. The most common style consisted of having a soloist take center stage, and improvise a solo within the framework of his bandmates playing support. Swing music began to decline in popularity during World War II because of several factors. Most importantly it became difficult to staff a “big band” because many musicians were overseas fighting in the war. By the late 1940s, swing had morphed into traditional pop music, or evolved into new jazz styles such as jump blues and bebop. Swing music saw a revival in the late 1950s and 1960s with pop vocalists such as Frank Sinatra, Judy Garland, and Nat King Cole, as well as jazz-oriented vocalists like Ella Fitzgerald. via Swing music – Wikipedia, the free encyclopedia.